Antique Bridge Tables were designed from the early Georgian period on-wards for the card game Bridge. Bridge was most popular in the Victorian and Edwardian periods and was used with sets of cards with artists painting comical pictures on the back, these card sets can be very collectable and sought after now. The game of Bridge can be traced back to the early 16th century, originally called Whist in Britain as was a big part of entertainment and gambling. 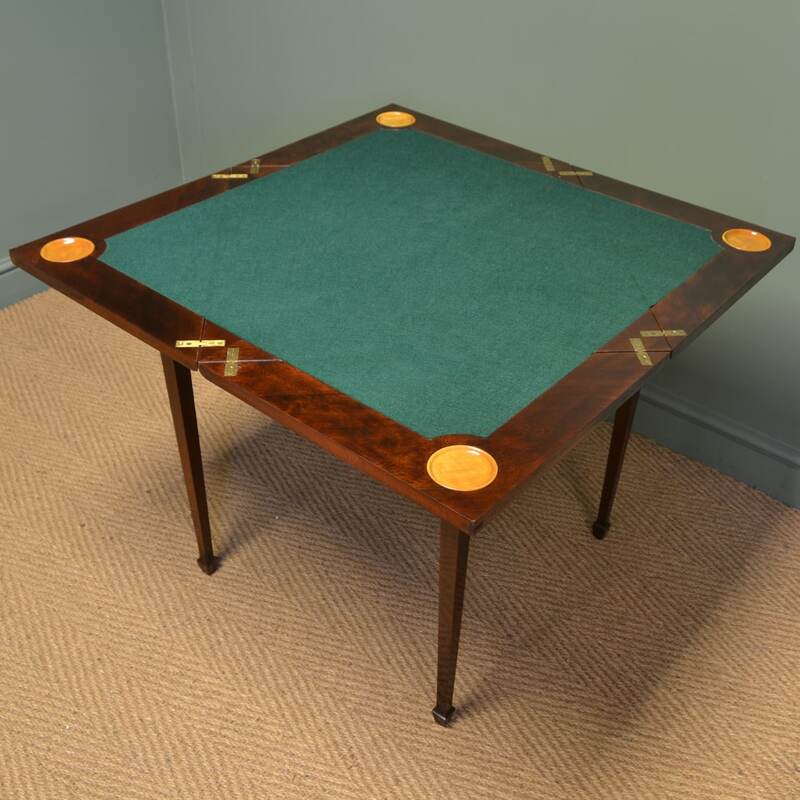 Antique games tables were made especially for playing the game of Bridge and as these pieces were made to impress, no expense was spared in their construction as guests would see and use them, so having a pretty games table would be a good piece of furniture to show off. Here at antiques world, we get some beautiful examples for sale, in beautiful woods like Mahogany, Rosewood and Oak. The best will usually have inlay from fine boxwood to more expensive brass and decorative feet. Most will have a baize interior and occasionally counter wells in the corners. 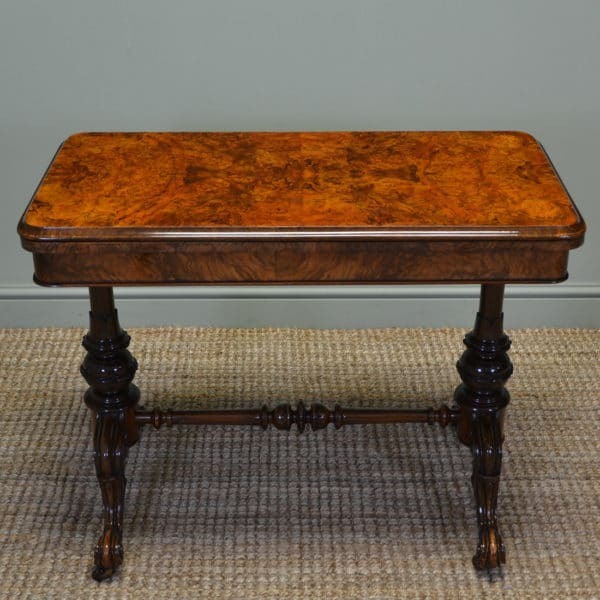 Have a look below at some of the stunning antique bridge tables we have for sale. 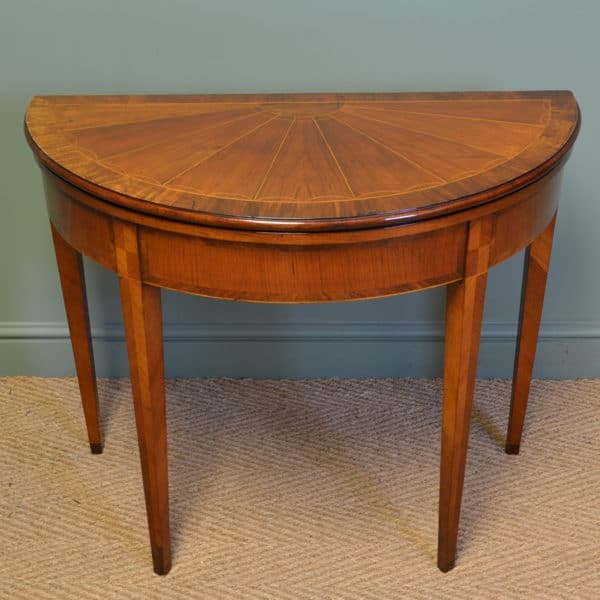 Spectacular Large Inlaid Envelope Mahogany Antique Card / Games Table. 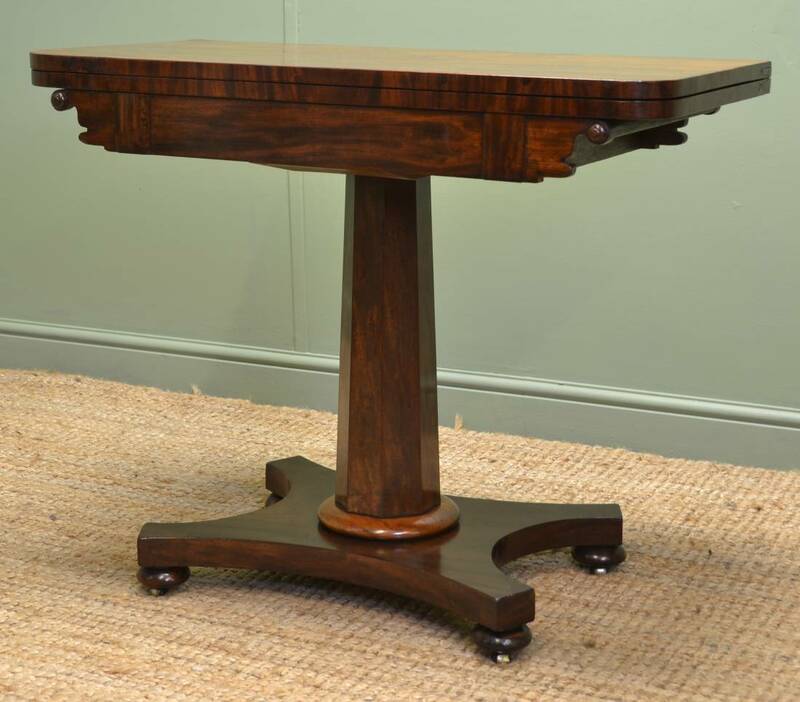 Below are a few examples of previously sold Bridge tables, but if any particular style looks of interest please let us know as we do get many similar designs in stock and we can try to locate something similar. 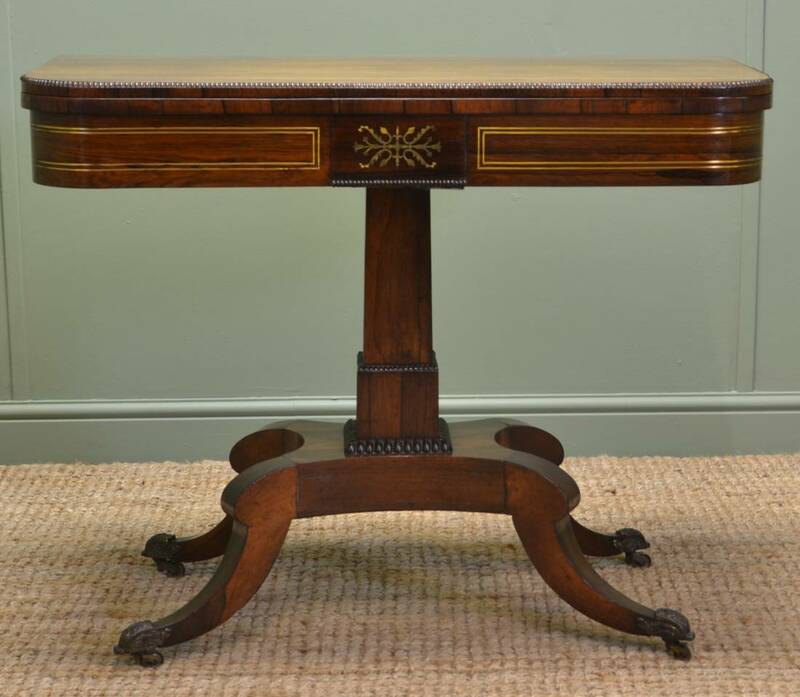 Victorian Walnut Antique Envelope Card Table / Bridge Table. 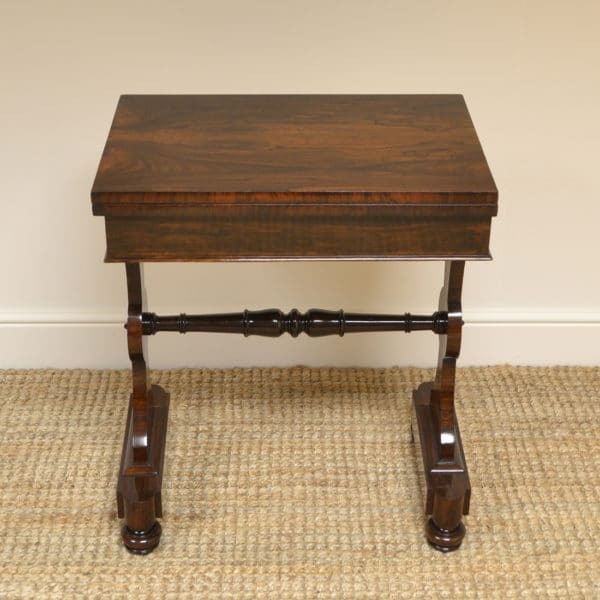 Dating from around 1900 this wonderful Victorian walnut antique envelope card table would make the perfect lamp table or side table when not being used for games. Made to a continental design but of English construction the quality of craftsmanship and timbers used is self evident. The envelope top swivels open and unfolds to reveal a green baize square playing surface. Below this can be found a central oak lined drawer with original decorative handle. The table stands on four beautifully turned legs with moulded cross stretcher, for added stability, and with central carved motif. 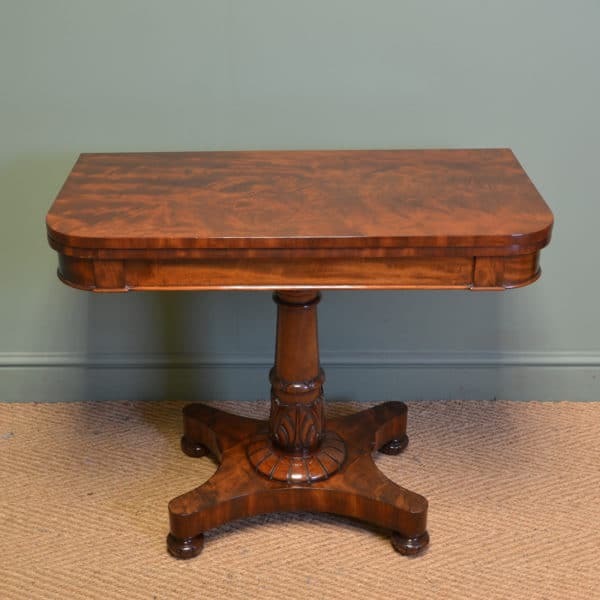 Magnificent Quality William IV Mahogany Antique Bridge Table / Games Table. 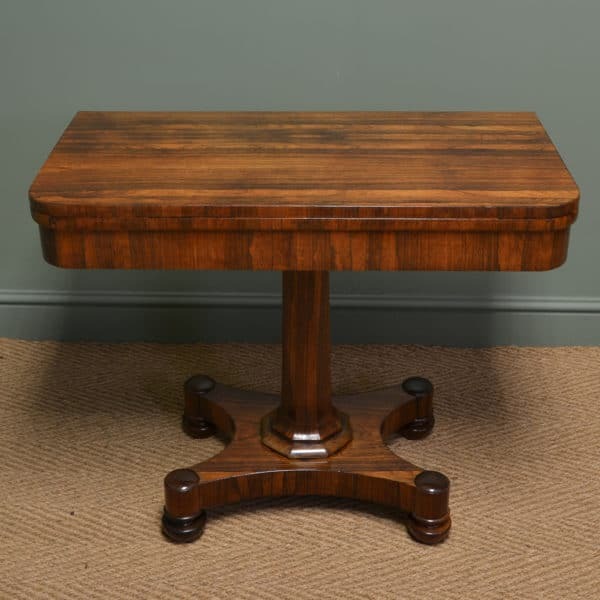 Dating from around 1835 this antique bridge table / games table is a magnificent example of a quality mahogany piece from the William IV period. It is in the style and quality of a Gillows piece. The top is beautifully figured, both when closed and opened, and has canted corners. It swivels and opens to double its size, allowing access to the games compartment with very old, possibly original, lining paper. Below the top is a wonderfully figured curved frieze above an elegantly turned, thumb moulded pedestal with decorative carved socle. 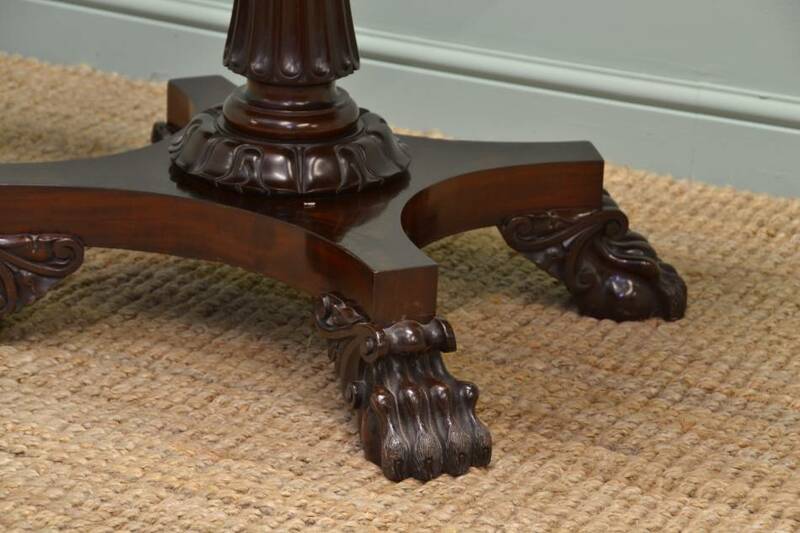 It stands on a simply stunning quadriform base of fantastic quality with carved lion paw feet displaying exceptional craftsmanship in the level of detail shown. These hide sunken brass castors allowing the antique table to be easily moved around. Georgian Mahogany ‘D’ End Antique Console Table / Bridge / Games Table. 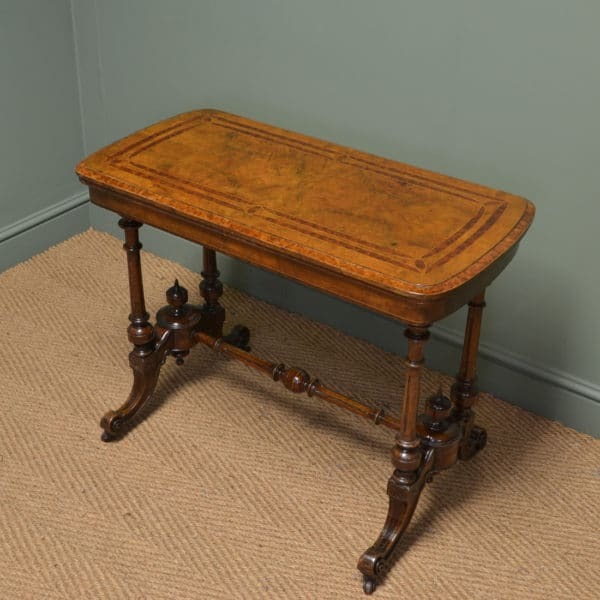 Dating from around 1800 in the Georgian period this delightful antique mahogany ‘D’ end console table transforms into a very usable games bridge table. 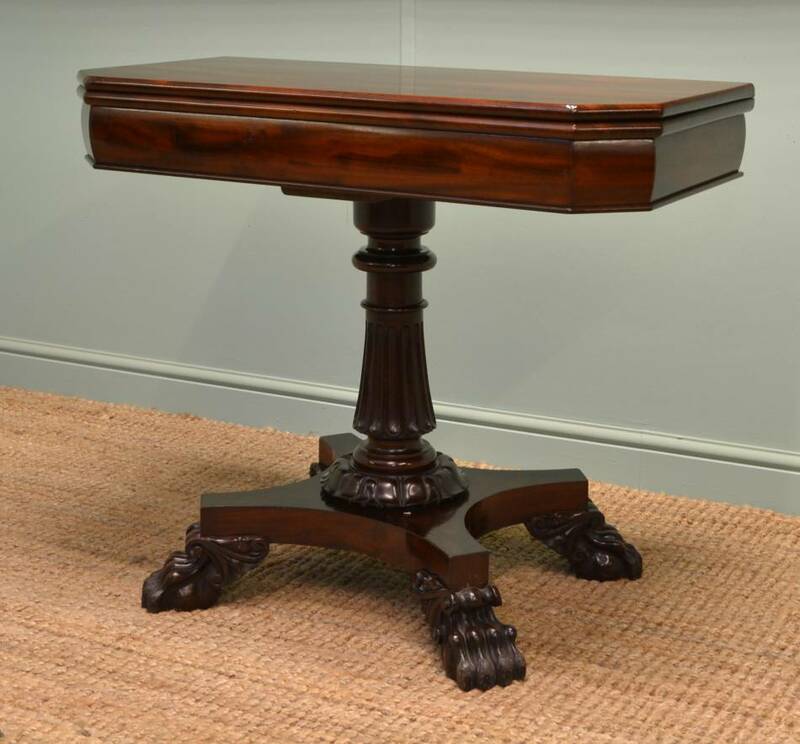 It has a polished top with a moulded edge above four tapering legs with spade feet. The legs to the rear move on a gate leg action to support the top when opened. The playing surface is circular and covered in a green baize fabric. 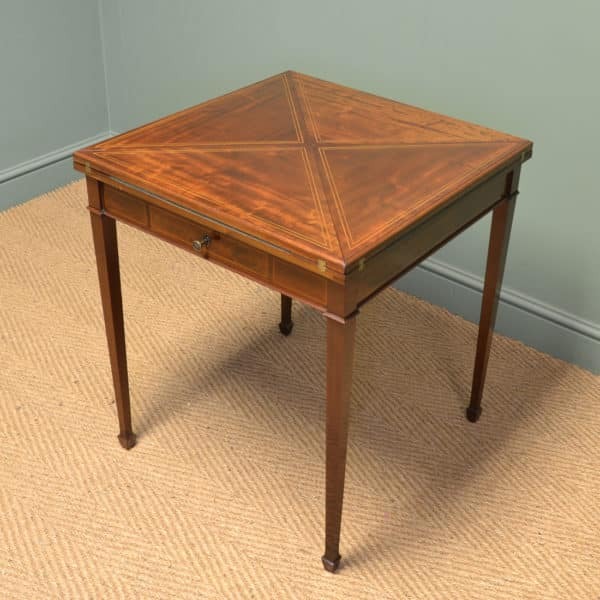 The table has a relatively deep apron displaying boxwood string inlay providing it with a rather refined look. 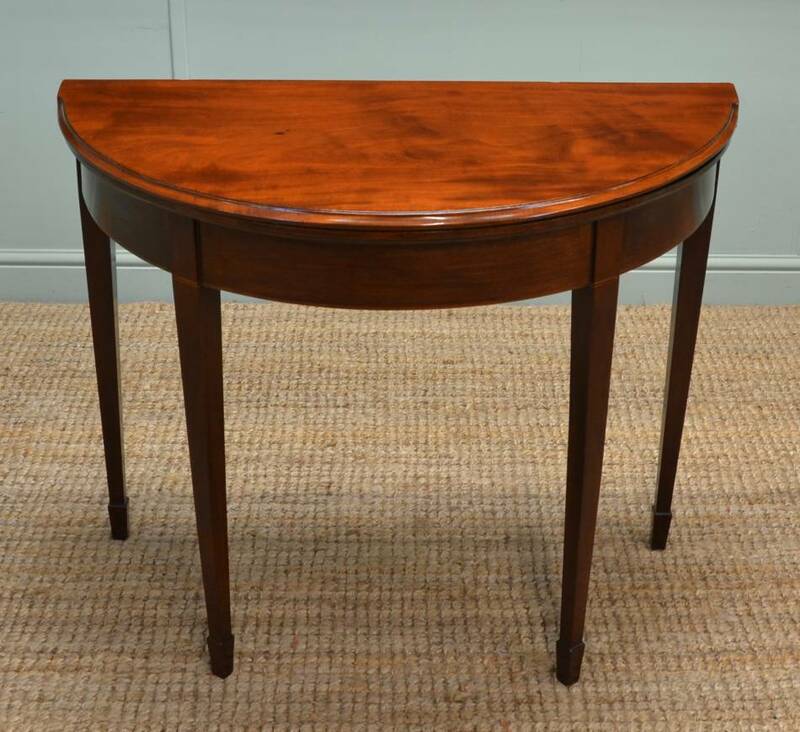 Fine Quality Regency Mahogany Antique Bridge Table / Games Table. 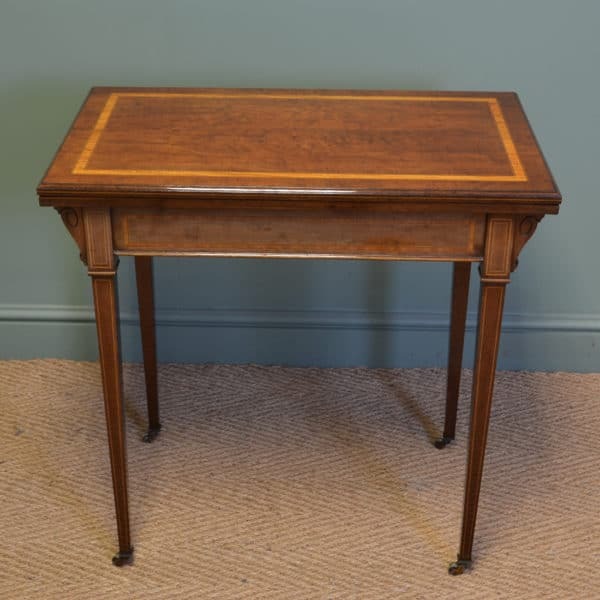 Dating from around 1830 in the Regency period this delightful antique games table / bridge table is made from fine quality mahogany. It has a beautifully figured top that swivels open, revealing a concealed games storage compartment in the process. The playing surface is made from a striking red baize. The top sits above a deep frieze with beautifully shaped corner brackets with small turned detailing. 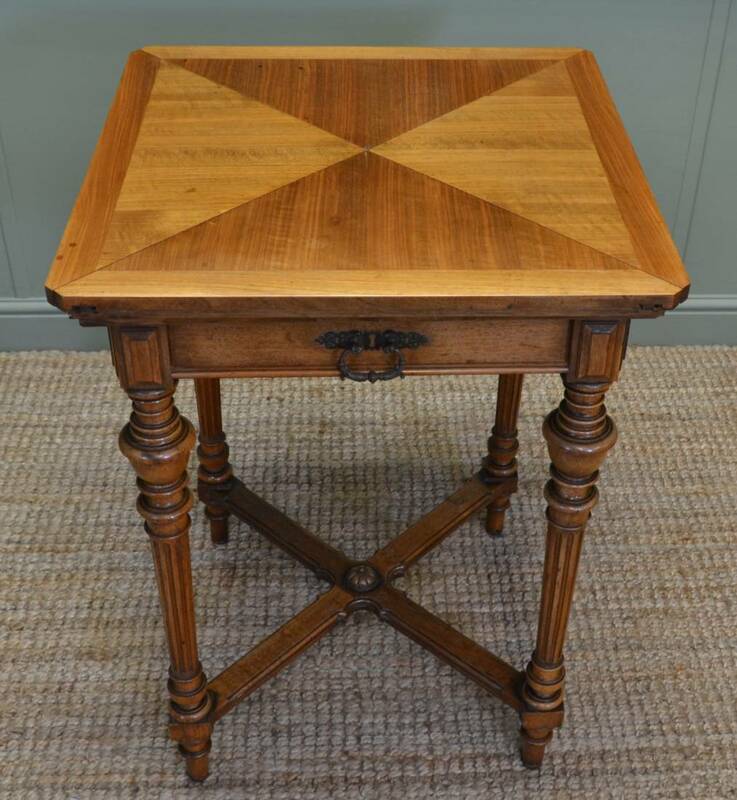 The table stands on an octagonal pedestal and quadriform base which is finished with small turned bun feet and brass castors. 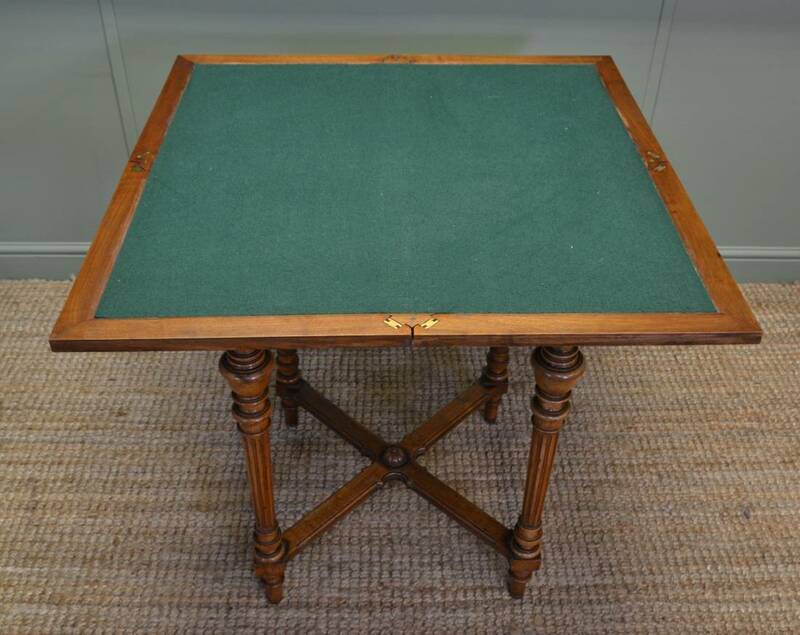 This antique games table would make the ideal side table when not in use, the perfect home for a lamp! 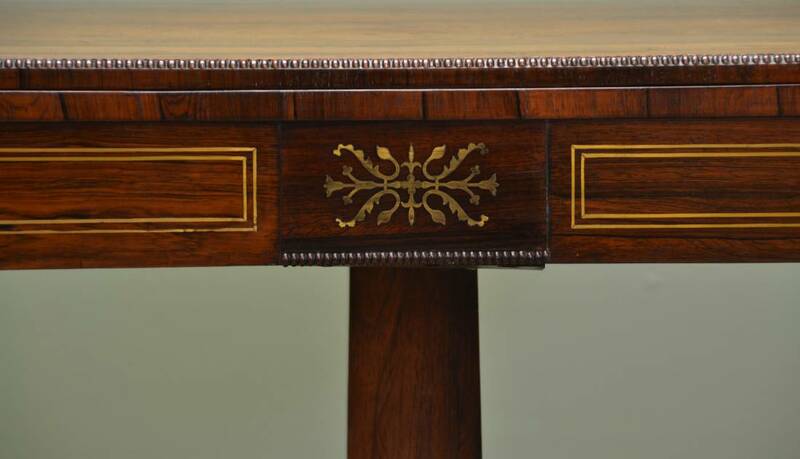 Finest Quality Regency Brass Inlaid Rosewood Antique Card / Bridge Table / Console Table. 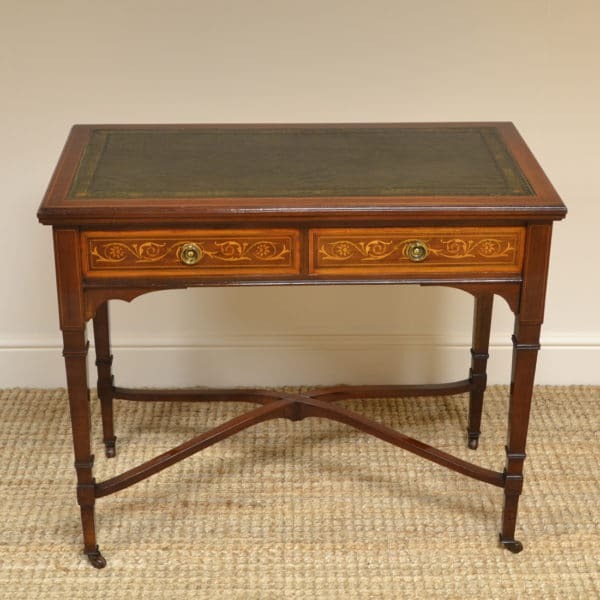 This antique Regency card table / console table, circa 1820, is constructed from the finest quality rosewood with delightful brass inlay. The rectangular top has a moulded edge and swivels open to double its depth, revealing a concealed games compartment in the process. 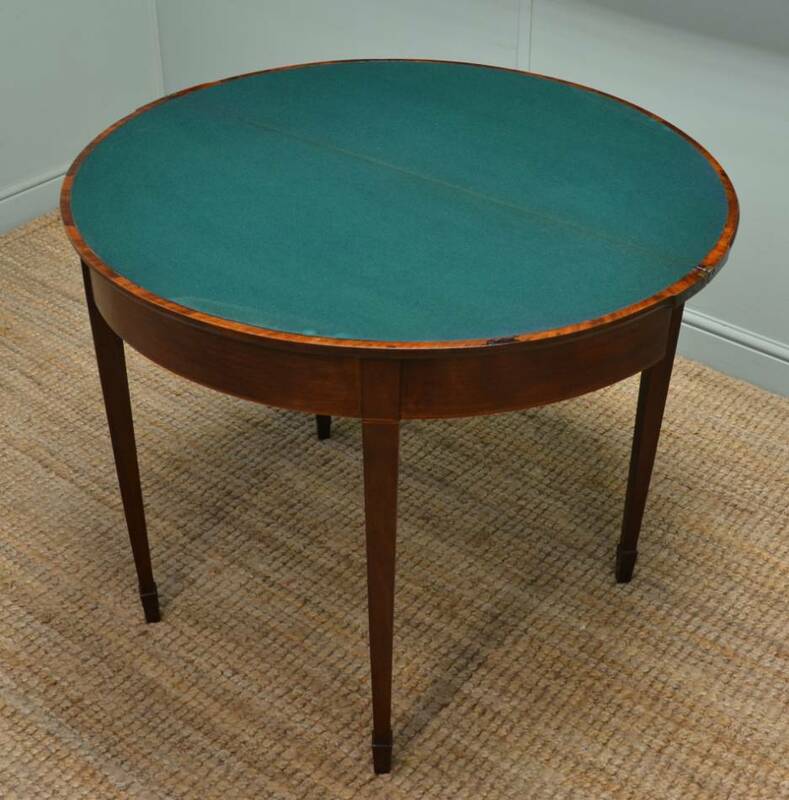 When opened the playing surface is strikingly figured and would make the ideal tea table. It stands on a square tapered pedestal with a quadriform base and four splayed legs finished with intricate brass castors.